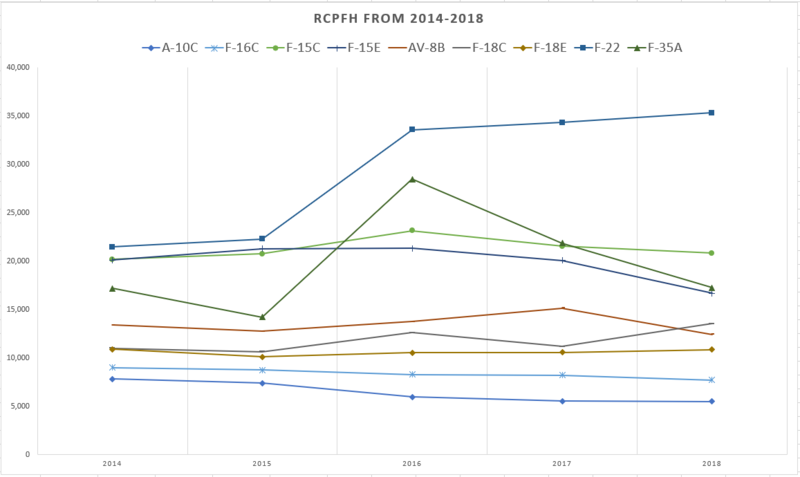 The FY2019 numbers will be released within a couple of weeks for RCPFH and I'll update the historical chart. Here is the chart through FY2018. PENTAGON: It’s official — the F-35 Joint Strike Fighter will begin operational test and evaluation next month, marking one of the most significant transitions for the closely watched program. Next summer, presuming no show stoppers appear during OTE, the program will move to full production. 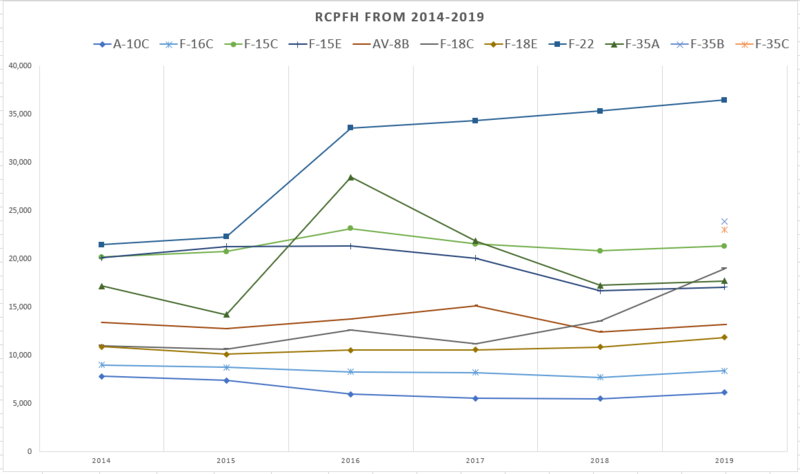 The RCPFH numbers for FY2019 just came in. For the most part they are stable (went up a little due to fuel costs) across the board except for the F-18C which shot up substantially. Also, the F-35B and C are on the list for the 1st time. I have added them to the graph. The plateauing of the F-35 numbers are related to the ongoing Parts/Depot issues. What is the R in RCPFH and what all does this value entail? Reimbursable. I posted it because it is the only annually released CPFH calculation that I know of. 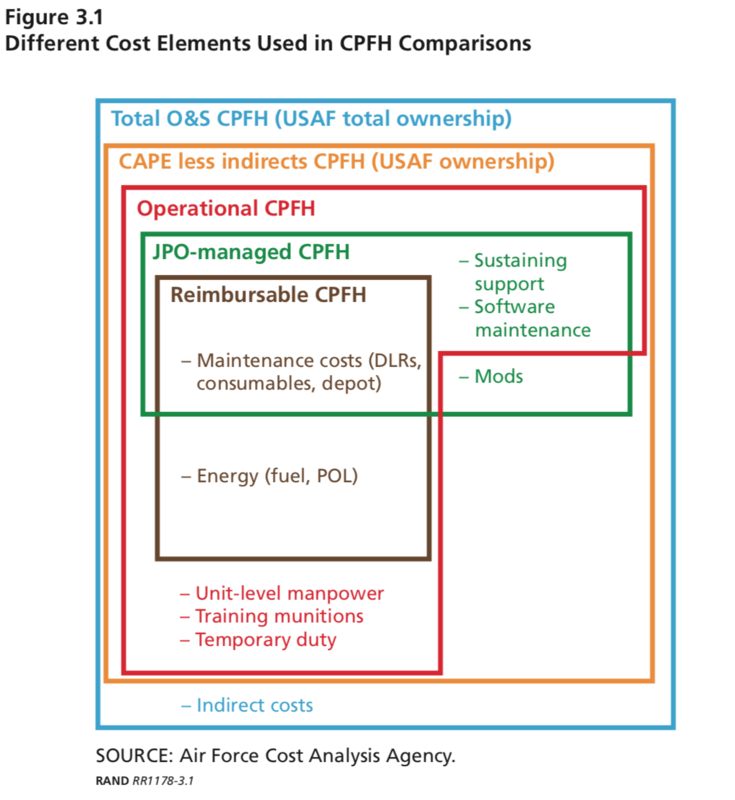 A related usage of CPFH is for flying-hour reimbursable billing rates, i.e., how much other DoD, other federal, other customers, and foreign military should be charged on a per-flying-hour basis. These rates build upon the FHP CPFH, adding in cost categories less directly impacted by flying hours such as depot-level maintenance costs. Basic fuel and Mx. Excellent. Thanks. LRIP 12: 64 A, 26 B, 16 C for USAF, USMC, USN bringing cumulative US totals of lot 1-12 to 290 A, 115 B, 60 C respectively. Clearly the block buy numbers do not include all partner projected buys for lots 12-14. Flight breaks down the 89 partner F-35s to include 18 B. Since UK accounts for 17 B, it suggests Italy may be only going for 1 B instead of 9 B.
Lockheed Martin Corp., Lockheed Martin Aeronautics Co., Fort Worth, Texas, is being awarded a $22,712,874,822 not-to-exceed undefinitized contract modification. It's amazing that the USMC will be 1/3 of the way to it's goal of 353 Killer Bees. They're not fooling around and aren't kidding when they say we can't buy them fast enough. It's also sobering to consider that the USAF will have more Stubbies in service than most air forces have planes. It's amazing that the USMC will be 1/3 of the way to it's goal of 353 Killer Bees. ..
No rush. 115 B comprises orders until lot 12 which will only be delivered in ~2020. 2018 USMC aviation plan indicated 126 AV-8B/TAV-8Bs in service, so the F-35B "in service" > AV-8B mark may be crossed in 2021/2022. Currently there are 6 AV-8B sqns (incl 1 FRS) vs 3 F-35Bs but that should change by end of 2022. Sundown of the AV-8B is planned to be FY 2026. P.s. US F-35 orders to lot 12 will pass the sum of both Rafale + Gripen built. The only plane that will stop F-35 production is an F-35 replacement. He's pandering to the LIV crowd (Low Information Viewers). He did the same thing here where he is adding the LL contract and the main contract together. He seems to forget that contracts are "price estimates" and the final price is what is agreed on at the end.